The World’s Biggest Baby Shower (WBBS) is the signature national fundraising initiative for Brave Foundation launched in May 2016 celebrating Mother’s Day. Register with Brave Foundation to hold a baby or fundraising shower during the month of May. You don’t need to be pregnant to hold a shower, and you don’t need to have anything relating to babies at your shower! This is the time to honour all mums and mothering role models in your family, community or workplace. You can also be part of the World’s Biggest Baby Shower at any time throughout the year, by hosting your baby shower at any time and raising money for Brave Foundation. A social media strategy will be aligned with this to encourage social media sharing of WBBS events. A local government strategy to encourage Membership Councils is also a focus of this awareness plan. To raise awareness of teenage pregnancy and the importance of building a supportive environment around those facing teenage parenthood. 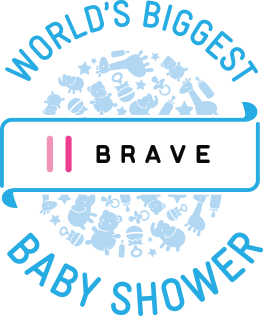 To raise awareness of Brave Foundation and the support and services available for those facing teenage pregnancy and their family and friends. To raise important funds for Brave Foundation to continue to support those facing teenage pregnancy and their family and friends. To engage with current and future parents to open up a discussion around teenage pregnancy, its challenges and how to overcome them.